Vatican News Report-Image: Pope Francis received the credential letters of Callista L. Gingrich as the new Ambassador of the United States of America to the Holy See. The ceremony took place in the Vatican’s Apostolic Palace. Her main responsibility as Ambassador will be to serve as the liaison between the Holy See and the U.S. Government. Ms. Gingrich was nominated to the post by U.S. President Donald Trump in May and confirmed by the Senate on 16 October. 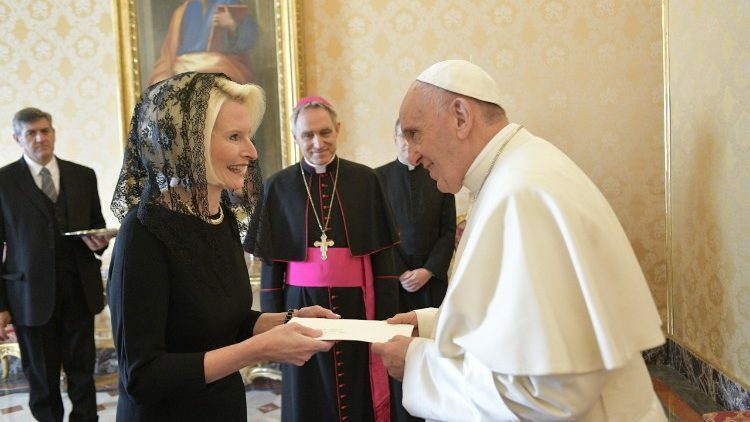 A communiqué released by the U.S. Embassy to the Holy See provides a brief biography: Ambassador-Designate Gingrich is the former President and CEO of Gingrich Productions, a multimedia production and consulting company in Arlington, Virginia. She is the author of the “Ellis the Elephant” children’s American history series and co-author of “Rediscovering God in America.” Ms. Gingrich is also the producer of several historical documentary films. She has sung for two decades with the Choir of the Basilica of the National Shrine of the Immaculate Conception in Washington, D.C. Previously, Ms. Gingrich served as a congressional aide in the U.S. House of Representatives and as the President of The Gingrich Foundation, which supports charitable causes.